Since the beginning of last year I have really got back into reading after barely reading any books for the past ten years or so (apart from books for college/university) but now I can't stop. I do prefer to read during the colder months being all cosy with blankets and candles but I have been able to get a lot of reading done in the garden this spring and summer! 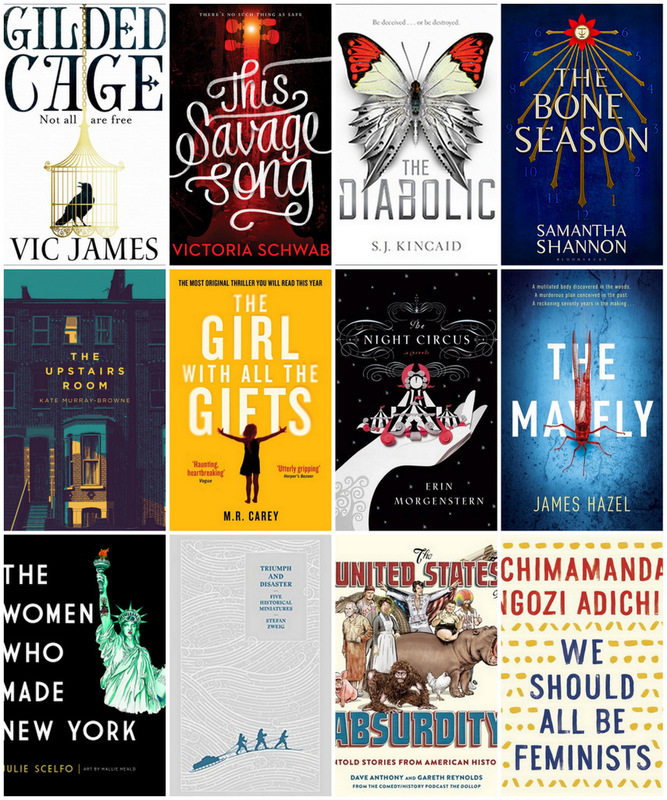 Holidays Gems, which is a great site for cheap holidays and last minute holiday deals, challenged me to pick my favourite books of last year and this year that I think would be great summer holiday reads as they are all so enjoyable, fairly quick and easy. They range from interesting and intense thriller mysteries to magical and fantasy options and finally a few quirky non-fiction picks. Books that are categorised as fantasy, magical realism or any that have a magical element to them are some of my favourites and from these categories I'd have to recommend The Gilded Cage by Vic James (I can't wait for the second book), The Night Circus by Erin Morgenstern and The Bone Season by Samantha Shannon, the later is amazing for any time of the year - read it! This category is perfect for a beach read as they tend to be very engaging and quick reads and if you are into post-apocalyptic and dystopian books then look no further than The Diabolic by S.J Kincaid, This Savage Song by V.E Schwab (it's a mix between YA fantasy and dystopian to me) and The Girl With All The Gifts by M.R Carey. For thrillers and mysteries with a dark but contemporary edge then check out The Upstairs Room by Kate Murray-Browne which has just been released. Another dark read is definitely The Mayfly by James Hazel! Lastly some non-fiction that is very different and also inspiring; for the inspiring picks you need to read The Women Who Made New York by Julie Scelfo and Triumph and Disaster - Five Historical Miniatures by Stefan Zweig as well as We Should All Be Feminists by Chimamanda Ngozi Adichie. For a very bizarre non-fiction pick, check out The United States of Absurdity by Dave Anthony and Gareth Reynolds which seems very appropriate considering wha happened yesterday in the not so good ol' US of A. Have you read any of these books? What are you planning on reading this summer? I haven't read any of these but I love a good book recommendation, especially fantasy/magical! I'm gonna look out for these on audiable! Oooo they all sound so nice! I really want to try and read more over the holidays so I may just have to pick up some of your recommendations! I love magical and fantasy books so I'll add these to my reading list. Your blog really makes me want to read more. I need to get into the routine of trying to read before bed. Great recommendations for my next read. I'm reading The Circle at the moment but I'm finding it really hard to get into. I already have such a big stack of books I need to get through!